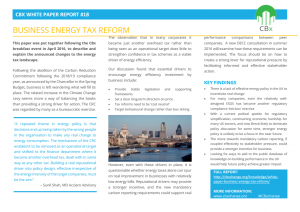 This paper was put together following the CBx evening event in April 2016, to describe and explain the announced changes to the energy tax landscape. On 16th March 2016, the Chancellor set out plans for a major reorganisation of the UK business carbon tax system, as part of the 2016 Budget. This included abolishing the Carbon Reduction Commitment (CRC) after the 2018-19 compliance year, and compensating for the revenue thus lost through an increase in the Climate Change Levy (CCL). At the “Business Energy Tax Reform” event on 14th April, members of the built environment industry met to consider the implications. With special thanks to our fantastic panel of experts; Patrick Brown, of British Property Federation, Gary Shanahan, of Department of Energy and Climate Change (DECC), Sunil Shah, of Acclaro Advisory, and Anna Menezes, of Tesco.